One-Day River Pass is for boarding on Chao Phraya Tourist Boat (Blue Flag), the most convenience and reliable boat service to explore Bangkok. Chao Phraya Tourist Boat proceeds along the Chao Phraya River and stops at the piers that connect to Bangkok's tourist attractions. Travellers can easily explore Bangkok with the convenience and safety when board Chao Phraya Tourist Boat. 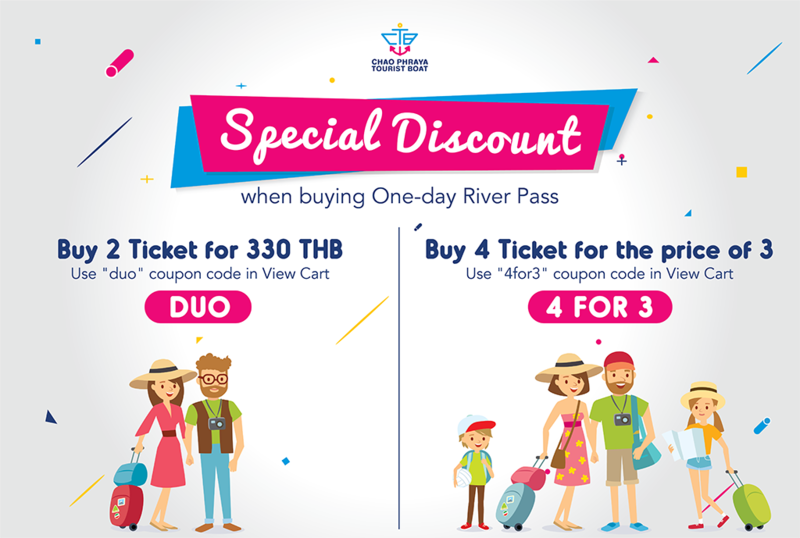 One-day River Pass holders are able to travel from pier to pier with no concern about purchasing boat ticket again or getting lost. The price is only 200 Baht with special discount when purchasing online! From 16:00 (from Phra Arthit) or from 16:30 (from Sathorn), boats extend their routes to Asiatique as well. * The boat route extends to Asiatique in the evening. (See Boat Time Table Here).